It’s almost flu season again, which means your year-end goals could be in jeopardy. 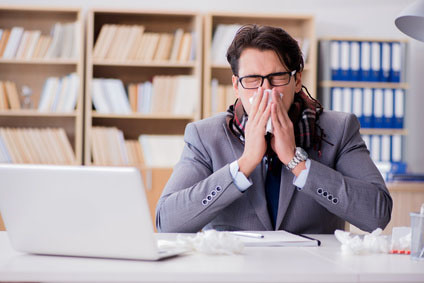 Work is one of the top places people contract germs that make them sick, and each year around this time, offices start to look like ground zero of a sniffling, sneezing, coughing, achy plague. There are many ways to prevent employees from getting sick, such as encouraging them to get flu shots, get plenty of exercise, and allowing them time off after big productivity pushes. There are still more things you can do to prevent the spread of germs around the office. The truth is, loading up on hand sanitizer and wiping down all the staplers every day won’t be nearly as effective as this one, fool-proof strategy: keeping sick employees out of the office in the first place. When people miss work, it’s tough on your company. Being short-staffed, paying out overtime to help cover missed shifts, and asking managers to fill in while leaving off other duties isn’t a sustainable way to do business. Unfortunately, it’s the reality when workers get sick. It’s tempting to ask an employee to come into work when sick. It saves you from scrambling around to find a last-minute replacement, or from having to reschedule critical meetings because a key member of your team is out. Unfortunately, this mindset can actually hurt your business more in the long run. If you’ve ever tried to work while sick, you know that a stuffy nose, aches, tiredness, and being hopped up on cold meds is a recipe for failure. You’re simply not at your best. You’re much less productive, and perhaps short-tempered and easily frustrated, too, making it hard for your team to be as productive as well. It’s the same for your employees, too. While getting shift coverage last minute will take time out of your day and may incur some overtime costs, you’ll get a better performance out of the covering employee than you would from the sick one. Meanwhile, your sneezing, coughing employee is spreading germs around the workplace. Every time she touches a door handle, uses a tissue, or hands off a stack of papers, she risks infecting someone else. If you brought in a healthy employee instead, those germs would stay home. The above are just the short-term problems. In the long run, asking employees to come into work even when they’re sick slows their recovery. They’ll be less productive for longer because they’re not getting the rest they need. They’re still spreading germs around the office, day after day. Plus, they’re more likely to relapse later or get sick again soon, starting the cycle all over again. When your employees feel like they can’t call in sick, they will over exert themselves, again and again. With no time to rest, it will soon be exhaustion instead of illness causing low productivity. Not only will that hurt your bottom line, but you’ll lose valuable, hard-working employees due to job dissatisfaction. Instead, nip illness in the bud by creating a culture that encourages employees to have healthy boundaries when it comes to deciding when to come into work. Train managers to be supportive when they get that phone call an hour or two before an employee’s shift. Then, stay in contact with the employee so you can decide together when it’s okay to come back to work. Have a system in place for getting shift coverage. Know when other employees may be available to take on a last-minute shift and require all workers to keep managers and teammates in the loop on any projects, meetings, and progress so others can help out. Promote healthy lifestyles by encouraging exercise, good nutrition, and healthy work-life balance. Consider creating a “work-from-home” program to allow sick employees to get the minimum done between resting at home, without infecting coworkers. Want more strategies for managing sick employees? Arch Resources Group can help. Contact us today to find out how!